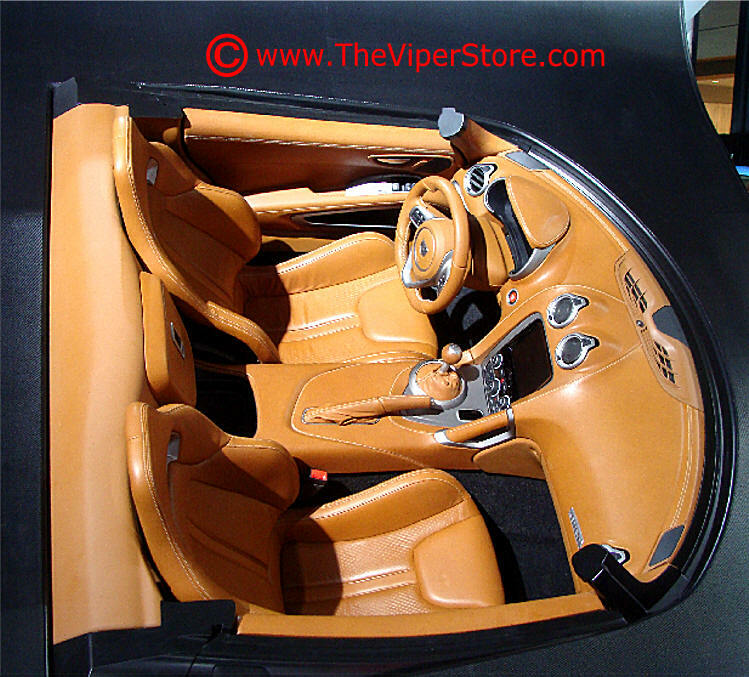 The last of the special edition Dodge Vipers sold out rather quickly. Dodge has announced that all 206 units have been spoken for since going on sale less than a week ago on June 24. The 1:28 Dodge Viper Edition ACR was limited to 28 units and was sold out within 40 minutes, while the VoooDoo II Edition ACR, limited to 31 units, was spoken for within two hours. All 25 units of the Snakeskin Edition GTC were sold out within two ordering days and the GTS-R Commemorative Edition ACR, limited to 100 units, was also sold out within two ordering days. In responding to customer requests Dodge has also confirmed that it will introduce the Snakeskin ACR Edition and will build as many as 31 units. All-aluminum 8.4-liter V-10 rated 640 horsepower (477 kW; 649 PS) and at 600 lb�ft (813 N�m), Tremec TR6060 six-speed manual transmission with final drive ratio 3.55, 50 percent improvement in torsional stiffness over previous model, electronic stability control, traction control, 4-channel anti-lock brake system (ABS), carbon fiber and aluminum skin with .364 drag coefficient (Cd), Pirelli P Zero Z-rated tires, 4-piston Brembo brakes with fixed-aluminum calipers with vented 355x32mm diameter rotors, 20 mm lower seating position, 7-inch full-color customizable instrument cluster, Uconnect RA3 or RA4 Access in-vehicle connectivity system with optional SiriusXM Travel Link, Harman Kardon audio system, bi-xenon projector headlamps with white light-emitting diode (LED) daytime running lamps and LED turn signals, LED taillamps with integrating stop-and-turn illumination and snakeskin texture lens, five-spoke forged aluminum "Rattler" wheel with fully polished (standard), fully painted Hyper Black or fully painted low-gloss black finishes. 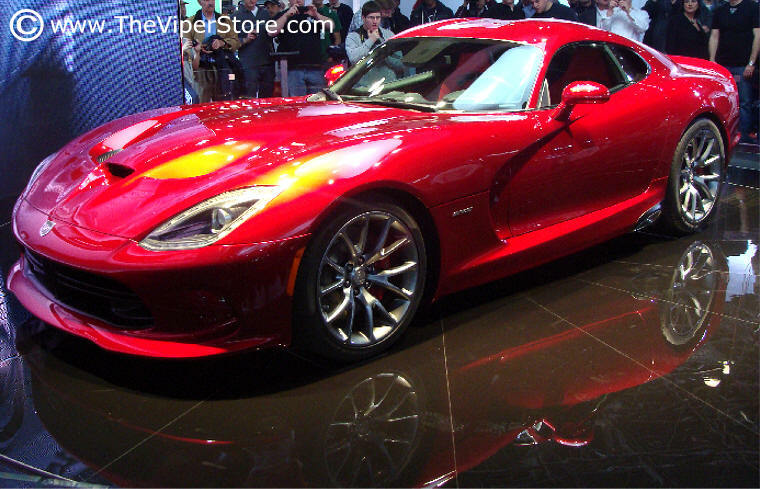 Top speed of the SRT Viper is 206 mph (331kmh). It will be the first to feature Viper's third logo, nicknamed "Stryker". It is a race car designed for the GT class of the American Le Mans Series, designed and built by SRT Motorsports and Riley Technologies. It includes Michelin GT tires. 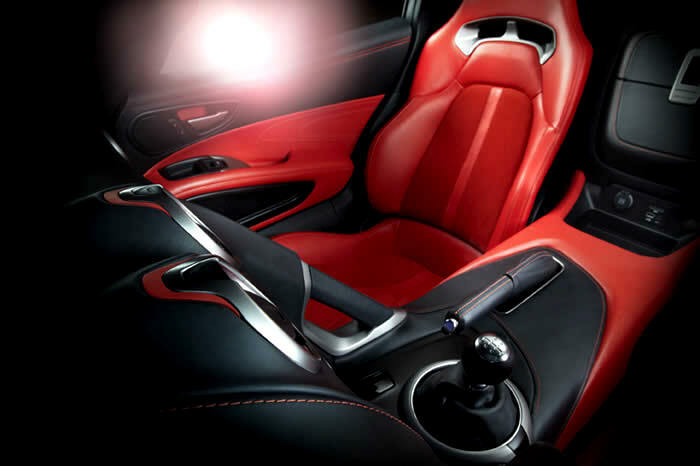 The vehicle was unveiled at the 2012 New York Auto Show. 2014 SRT Viper TA (Time Attack) package is a limited (33 units) version of SRT Viper coupe with Pirelli P Zero Corsa tires, matte black Sidewinder II wheels, two-mode Bilstein Damptronic suspension with firmer levels of damping and a smaller spread between modes than SRT Viper GTS; shock dampers, springs and road racing derived stabilizer bars retuned for optimal on-track performance; aluminum structural X-brace replaced by a lighter carbon fiber brace, brake calipers in black anodized finish with the Viper logo in Crusher Orange, Crusher Orange body colour with black 2D TA logos behind both front wheels, black Stryker logo on the front fascia, black interior with Crusher Orange accent stitching on the cloth seats, instrument panel (through the cowl), center stack, console, pull brake, shifter boot, shifter head, steering wheel and upper doors. Top speed is 206 miles per hour (331.5 km/h). In March 18, 2013 MotorTrend tested the SRT Viper TA in Mazda Raceway Laguna Seca to set a lap time against the 1.33.70 lap time holder Chevrolet Corvette ZR1. 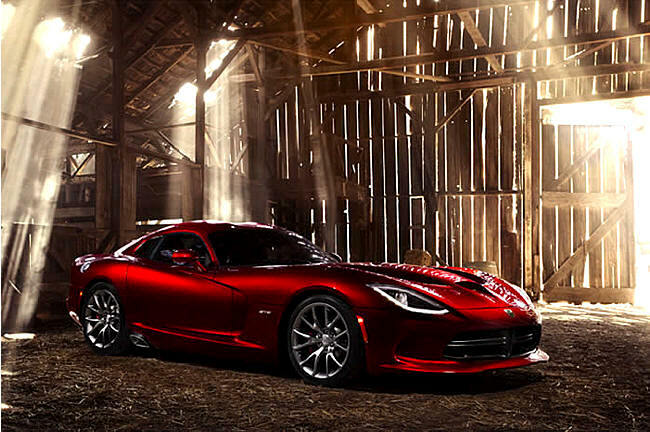 The SRT Viper TA beat the lap time in 1.33.62 seconds using Corsa Tires. 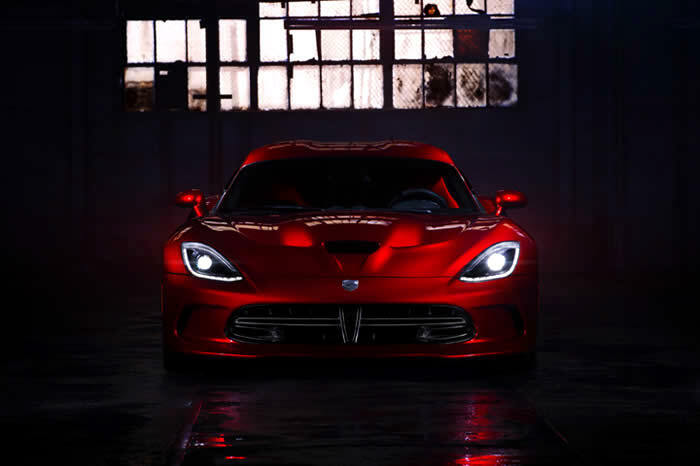 The SRT Viper TA beat the original time in 1.30.78 seconds using Slick Tires. The vehicle was unveiled in 2013 New York International Auto Show. 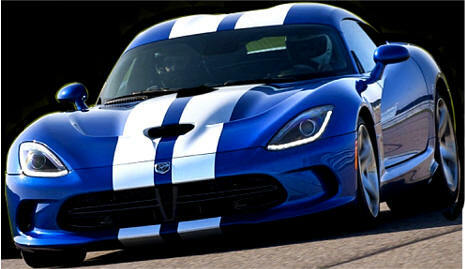 SRT Viper will be built in the Conner Avenue Assembly Plant in Detroit, MI with production beginning in late 2012. 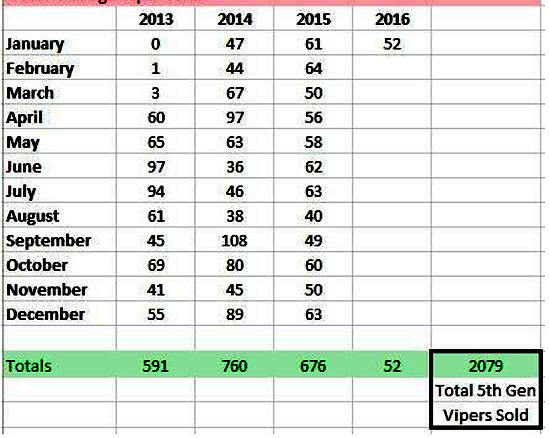 2015 SRT Viper became available in December 2014 with an increase of 5HP to the new drive train with a 1mpg improved mileage rating. Dodge also lowered the pricing on the new Vipers by as much as $15,000.00 to stimulate sales with new pricing starting at around $85,000.00. 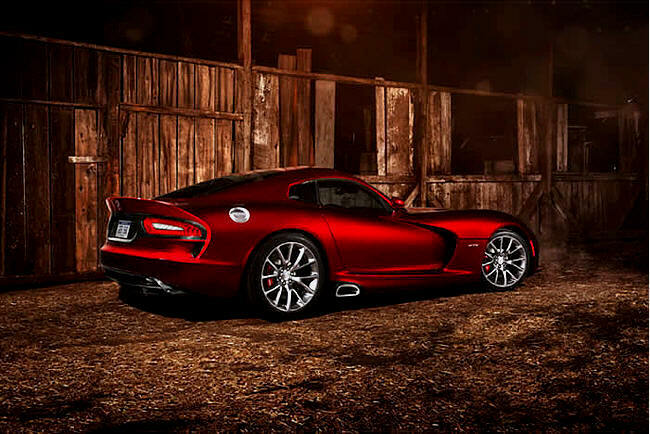 "Other changes include a new Viper GT trim, which fills the gap between the base car and the loaded GTS. 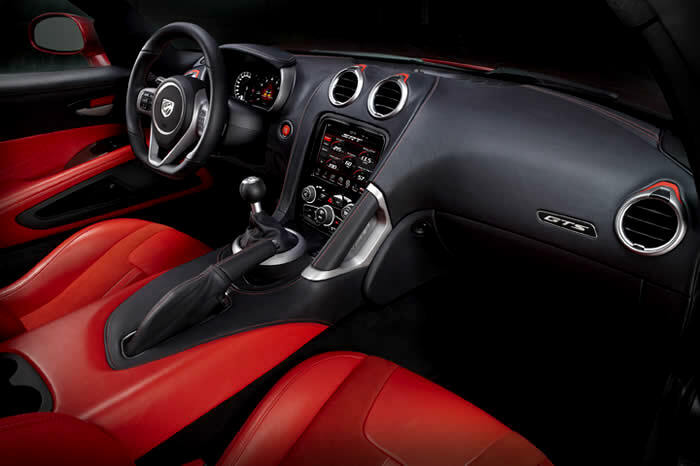 GT buyers get the two-mode, driver-adjustable suspension and five-mode electronic stability control system from the GTS, along with Nappa leather seats with Alcantara accents and contrast stitching. The Viper TA returns as the improved TA 2.0. The 2.0 part of the moniker refers to the updated aero package, which incorporates a bigger rear wing, new front dive planes, and a new carbon-fiber front splitter. The package improves downforce to 400 pounds at 150 mph versus the 2014 Viper TA's 278 pounds at 150 mph. The rest of the TA's myriad performance enhancements to the chassis, suspension, and brakes carry forward. Order a new 2013 Viper BOOK today - Click Here! 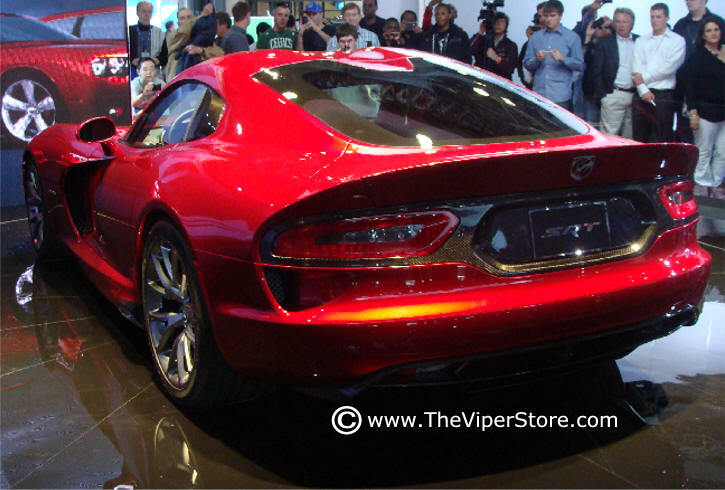 See all 52 Photos of the NEW 2013 Dodge SRT Viper "Stryker"
512 cubic-inch engine producing 640 horsepower. 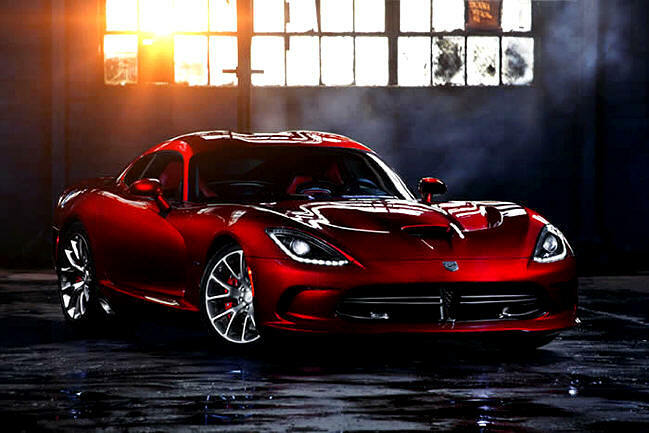 The New SRT Viper is coming in two versions. The standard SRT Viper and the upgraded SRT Viper GTS. Both cars will have the same drive train. A V-10 engine with 640 HP. 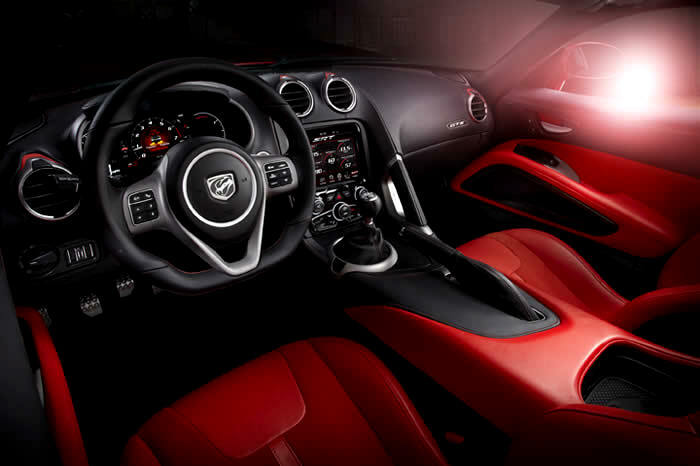 The GTS will have an upgraded interior and the large hood air intakes similar to the Ford GT40. It will come in nine colors with the ninth color still to be determined. Detailed information - See Links below. They open up into a new Window.